Denver: On New Year`s day, children in Colorado woke up to celebrate the new year with an animation series made by Denver-based Indian American Manick Sorcar. The programme, which was aired for two hours on the PBS channel, has been running every year since 1990, making it a record of sorts. 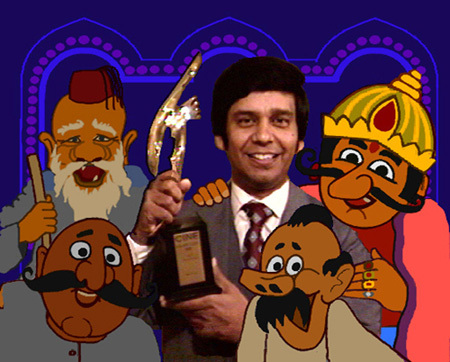 The series "Animation of India" included four of Sorcar`s award-winning classics -- "Deepa and Rupa: A Fairy Tale from India", "The Sage and the Mouse", "The Woodcutter`s Daughter", and "Sniff". While "Deepa and Rupa", which won the Gold Plaque at the 26th Chicago International Film Festival, is based on a popular story from Bengal`s "Thakumar Jhooli" (Grandmother Tales), "The Sage and the Mouse" and "The Woodcutter`s Daughter" are from the fables of the Panchatantra. "Sniff" is based on a popular nonsense poem by satirist Sukumar Ray in "Aabol Tabol". "Deepa and Rupa" is India`s first film that mixed animation with live action. All works are produced in English, except for "Sniff" (based on "Gandhabichar"), which is in Bengali with English subtitles. These animations are popular at the elementary schools where Sorcar is frequently invited to make a presentation and conduct workshops on animation with the students. Sorcar, an engineer-artist-animator, is the eldest son of celebrated Indian magician the late P.C. Sorcar. Referring to the 20th anniversary of Sorcartoons, as it is called here, Sorcar said, "When you fall in love doing something, you find magic in it. I can`t believe it has been that many years - many of the kids who watched the first telecast are probably watching with kids of their own now and new kids are joining in each year. What can be more pleasing than watching the smiling and giggling faces of happy children first thing in the morning of a New Year!"